The personalized medicines market – which tailors drugs and treatments to the individual patient – is expected to reach revenues of $149 billion by 2020, according to Pharmaceutical Commerce. And the rising use of biosimilars – a biologic medical product that is a near-identical copy of an original product by another company – is expected to result in the near doubling of the size of pharma cold chain logistics business over the next three years. 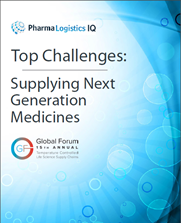 We sat down with Catherine Coppage, Supply Chain Planner, Personalized Medicines at Kiadis Pharma; Javier Gomez-Contreras, Supply Chain BGx LATAMOE Latina-Mid East Africa-India & Asia Pacific Lead at GlaxoSmithKline; and Jeremy Cress, Director Of Operations, Fibrocell Science to dive into the challenges and opportunities distributing personalized medicines present.